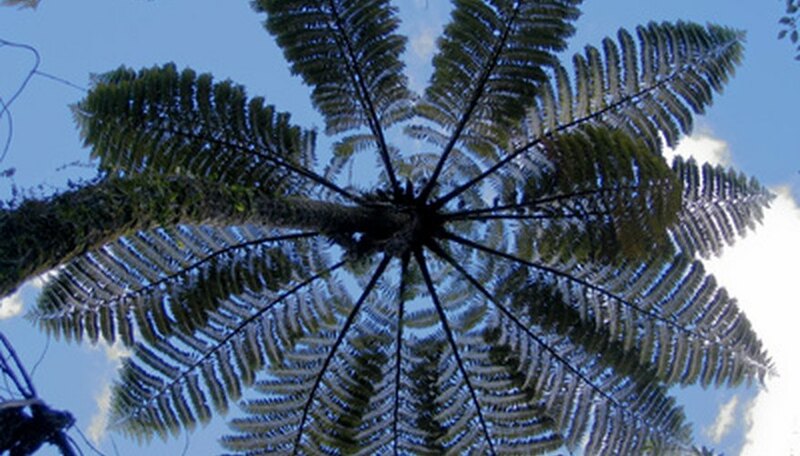 Where Is the Silver Tree Fern Found? When to Plant Korean Rock Fern in Spring? Lycopodium squarrosum, commonly known as rock tassel fern, is defined as an "evergreen perennial herbaceous epiphyte or fern ally," by Michigan State University. That means it reproduces by spores, with sporangia found on its cones or leaf axils. Rock tassel fern is a member of the club moss family and is native to Africa, Polynesia, Australia and Asia. In the U.S., it grows outdoors in USDA hardiness zones 10 to 12. It also can be grown indoors with the proper care. Place your rock tassel fern in part to full shade. Because it grows in trees and the low parts of rain forests, the plant cannot take direct sunlight. Keep the moss constantly moist. Choose a medium that has a high percentage of peat moss. Use a humidifier in the room to keep the air moist, or mist your plant at least every other day. Misting, however, can lead to foliar diseases. Fertilize with a light dose of fish emulsion or use a fertilizer specifically for houseplants at half strength. Do not fertilize during the dormant winter months. Place a layer of sphagnum moss about 2 or 3 inches thick in the bottom of the wire basket. Remove the juvenile staghorn ferns from their nursery pots they came in and knock the excess soil from the root balls. Leave as much of the roots intact as possible. Place three of the staghorn ferns around the bottom of the basket turned almost completely upside down so that the fronds hang out of the bottom sides through the wire and the root ball sits on top of the layer of sphagnum moss inside. Make sure that the sterile shield fronds are on the outside of the wire. Fill the basket with sphagnum moss. Make a depression in the moss in the top of the basket enough to plant the fourth fern upright and gently pack the moss around the roots. Add more moss so it is packed tightly and the ferns hold in place. Water thoroughly and let the plant drip dry. Silver tree fern, or ponga (Cyathea dealbata), is native to New Zealand's montane forests--at altitudes between 1,500 and 4,000 feet--and lowlands. Standing up to 33 feet high, it has large, horizontal fronds atop thin, silver stalks. The fern is recognizable from its green frond's silvery-white undersides. Plant your tree fern in well-drained, fertile soil in a shady, protected location, such as near a fence or alongside a building. Prepare the soil by mixing in a low-nutrient compost to encourage root growth. Water thoroughly, turning the hose toward the top of the tree fern and letting the water run down the woodsy trunk. This lets the plant absorb water through its trunk as well as through its root system. Keep the soil moist to a depth of about 1 inch. Fertilize periodically (every other month is fine) with organic fish bone and blood fertilizer. Sprinkle a handful around the trunk and canopy and water thoroughly immediately afterward so the fertilizer will be promptly absorbed by the roots. Regularly trim fronds once they start to droop or turn brown. This will result in a better-looking fern and also stimulate new growth. The Korean Rock Fern is a small fern that does well in the southern states. Plant in the early spring after all chances of frost have pasted and before summer heat. The lush dark green leaves form a dense mounding pattern. Plant under shade trees or large shrubs and cover roots with moist soil. This fern does well with small perennials and also in containers. Plant your Australian tree fern in a well-drained, sandy or loam soil. Amend the soil, if needed, with compost to make it fertile. Australian tree fern prefers partial to full shade. Keep your fern's soil evenly moist. Do not let the soil dry out beyond the top inch. Water more frequently during dry conditions, and water in the early morning so that the water does not evaporate quickly. Fertilize with organic fertilizers and well-rotted animal manure, according to the Australian National Botanic Gardens. Most ferns do not need heavy applications of fertilizer. 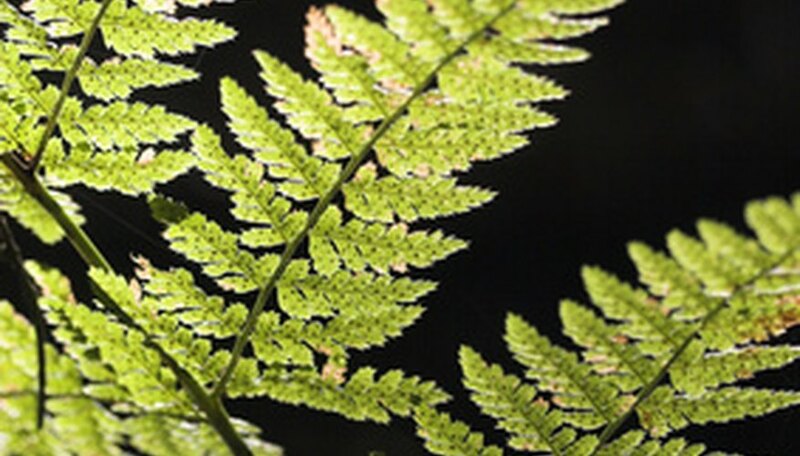 Propagate your Australian tree fern by removing the spores found on the underside of mature leaves and placing them on the ground. They do not need to be covered with soil. Prepare a 5 gallon planter by filling the base with 4 to 6 inches of potting soil or sand. 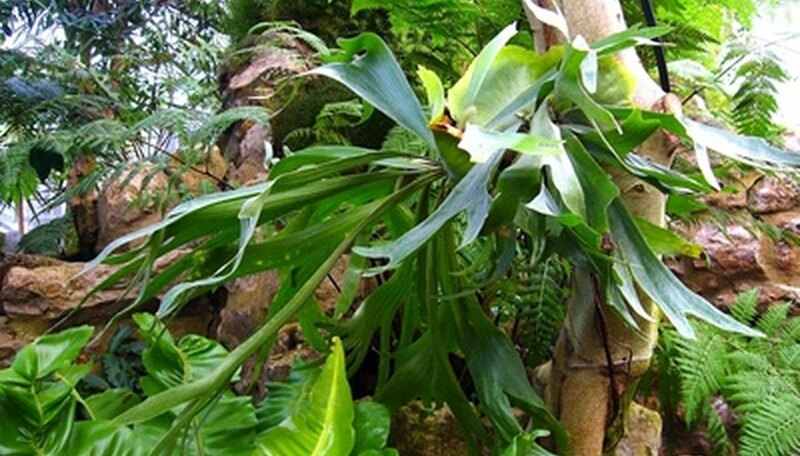 While the staghorn fern does not require soil to grow, this layer will provide anchoring for your pot and the plant over time. Fill the planter with cedar chips. You will anchor the ball of your staghorn fern within these chips. Burrow out a hole in the cedar chips large enough to accommodate a layer of sphagnum moss and the ball of the fern. Line the hole with sphagnum moss. Insert the root ball of the staghorn fern into the sphagnum moss-lined hole. Tuck a layer of moss atop the ball and around the base of the fern. Pour about 1/4 cup of slow-release, water-soluble 10-10-10 fertilizer into the moss and over the root ball and allow it to soak in. Layer a handful of cedar chips over the top of the moss to disguise the root ball and sphagnum moss.